I’m so excited to finally have my first protective style since my big chop and natural hair journey! I’ve waited this long because prior to February I’ve never spent this much time in my hair and now I’m able to have it at my fingertips and get to ‘know’ my hair – what it likes, what products work best and what doesn’t work at all. 6 months in, I have a pretty good idea of my hairs’ behavior and am ready to put it up and leave it alone for a bit; too much manipulation can cause breakage. I’ve decided to be late to the party and install the Poetic Justice, Janet Jackson inspired box braids. I’m excited because I haven’t had braids since I was a freshman in college. I am also a little nervous about my edges. I’ve spent the last six months diligently applying African Black Castor oil, massaging it in, and tying my hair up at night; doing everything I can to ensure that my edges are healthy and grow back strong and thick. I don’t want the braids, which are supposed to help protect my hair, rip all my hard work right out. My hair will be ‘inaccessible’ for at about 5 weeks, so I want to make sure I clean, deep condition and treat my hair to some extra moisture to prepare it for the upcoming style. First I ‘pre pooed’ before I shampooed. I want to be sure to keep as much natural oils in my scalp, while still cleansing my hair, a pre poo will allow you to do that. I’m pre pooing with Extra Virgin Olive Oil. I left it in for about 20 minutes, rinsed and shampooed as normal. After shampooing twice, I used the APH 2 minute protein treatment to add strength to my strands. I love this stuff because it’s quick and actual heat isn’t required. I placed a plastic cap over my head and allow the steam from my shower to active the properties in the protein treatment. After 2 minutes I rinsed thoroughly. I then deep conditioned my hair with Pantene’s Truly Natural Deep Conditioner, full review here. I love this conditioner!! My hair is soft and manageable for days. I like to leave this deep condition in for at least 30 minutes. After, I rinsed well and wrapped my hair to dry. I read that braids are best installed on natural hair that is stretched, so after my hair dried about 50% I applied Cantu Curling Cream, and then put in medium sized two strand twists to dry overnight. I’ve now had my braids in for about 5 weeks and I’m starting to miss my hair! I’ve been keeping up with my daily moisturizing routine, but I’m not able to easily wash and deep condition like before. I do love the convenience and styling options of the braids. They are so flattering and my mornings are a lot less stressful. Next Post! 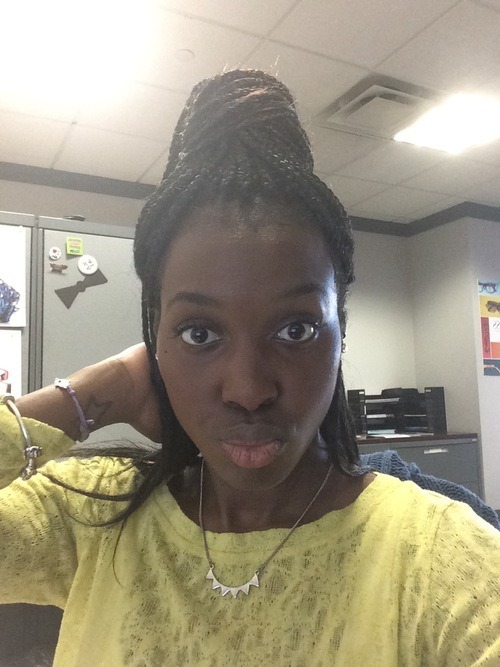 – How I wash, deep condition and moisturize my hair while in box braids.